When writing academic or non-fiction texts, we can be required to follow many different referencing and style conventions. 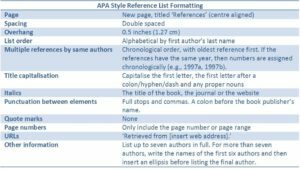 Having already looked at why good referencing is so important and introducing the MLA (Modern Language Association) style in recent posts, today I am continuing our introduction to the different referencing styles with a look at APA (American Psychological Association) style referencing. 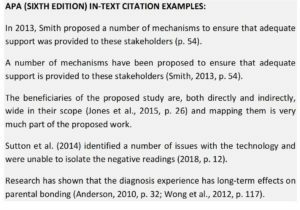 APA (American Psychological Association) style is a parenthetical author-date-page style of in-text citation and one of the most commonly used referencing methods – from psychology to social sciences. The most recent edition (the sixth edition) was first published in 2009. 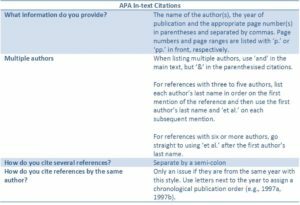 APA in-text citations are located in the text in parentheses and state the name of the author(s), the year of publication and the relevant page number(s) – these will be separated by commas. Multiple references within the same parentheses are separated by a semi-colon. If there is more than one author of the reference, then the author list will contain the word ‘and’ in the main text, but use the symbol ‘&’ in the in-text citation. For references with two authors, both authors’ last names are listed on each occasion they are mentioned or cited. For references with between three and five authors, all of the authors’ last names are listed on the first mention and after that the first author’s last name and ‘et al.’ are used. Finally, if there are six or more authors, the first author’s last name and ‘et al.’ are used throughout. If an author or a group of authors have published more than one reference cited in the same year, then you distinguish between these references by using letters to assign a chronological order of publication – for instance: 1997a, 1997b and 1997c. The APA reference section starts on a new page and is double spaced. 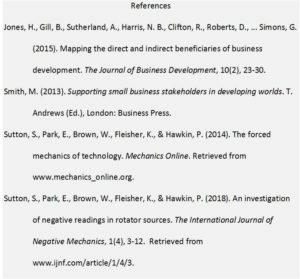 The references have a 1.27 cm overhang and are listed alphabetically by the first author’s last name. If there is more than one reference by the same authors then the references are listed chronologically, with the oldest first. References with up to seven authors are listed in full. If there are more than seven authors, then the first six authors are listed, followed by an ellipsis and then the final author. As with all referencing styles, references are formatted slightly differently according to the type of source they are – so attention to detail and consistency is required. For particular note in APA style, remember that this style does not capitalise every word in the title of the reference and it does not place article titles in quote marks. 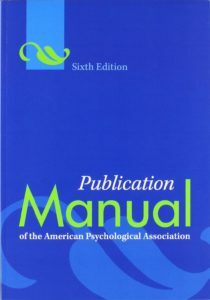 Publication Manual of the American Psychological Association, Sixth Edition. Available to purchase here: http://www.apastyle.org/manual/index.aspx. In the next AcEDemy blog post on referencing, we will be looking at the Harvard referencing style. Looking for a proofreader or editor? I am Dr Angela Stokes, an experienced academic, proofreader and editor. You can find out about the proofreading and copy-editing services I offer for academics and students here. 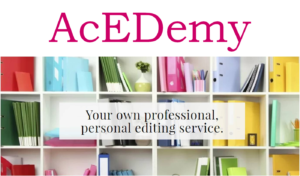 If you would like more information about how I can help you with your project or more about the editing services that I provide, then please get in touch by emailing: info@acedemy.co.uk. AcEDemy is a trading name of Dr Angela Stokes Editing Services. Copyright © 2019 AcEDemy. Powered by WordPress. Theme: Spacious by ThemeGrill.